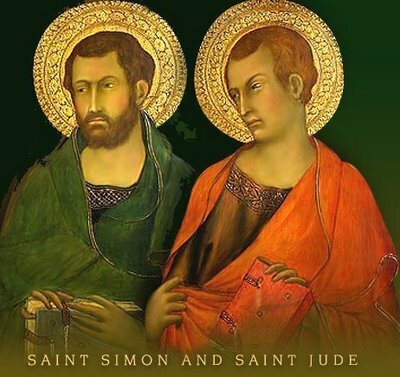 Today is the Feast of Saints Simon and Jude. Poor things, it seems you have to pair them up to get a reasonable feast day. How unfortunate! These men were Apostles; they were among the twelve. Saints Peter and Paul have two feast days each, and St. Paul was not even one of the twelve! So why do these two get lumped in together and who were they? Part of the problem with these two apostles is that, among the twelve, each of them has someone with the same name who is more famous. Of the 68 references to “Simon” in the New Testament, the overwhelming majority of them refer to Simon whom Our Lord renamed Peter. So we have Simon, who is called Peter, “The Prince of the Apostles,” and that other guy, also named Simon. Likewise, with Jude—which is just another name for Judas—the shadow of Judas Iscariot casts a heavy pall. Both of these names were very common is Israel, both being names of one of the twelve tribes of Israel. In fact, among the apostles, there were two Simon’s (Simon-Peter and Simon the Zealot), two Judas’ (Judas Iscariot and “the other” Judas) and two James’ (the brother of John and James the Less). More to the point, each one of these names is also mentioned as the name of a brother of Jesus in St. Mark’s Gospel. (6:3) They were very common names. So what do we know about these men? Really, we know next to nothing. Local tradition abounds with accounts of what happened with them. Apparently, they went off together and ploughed the missionary fields in either Egypt or Persia. On legend says, St. Simon was sawed in half, another that he died in a Roman rebellion. St. Jude may have been clubbed to death or beheaded with an axe. Unfortunately, their deaths are as obscure as their lives. It is quite uncertain if St. Jude the Apostle penned the Epistle of St. Jude or if it was written by someone else with the same name. It is a possibility, but we cannot know for sure. We should not feel to sorry for St. Jude, though. Since his death, he has become the patron saint of so-called “lost causes.” One such “lost cause” is that of children who are afflicted with Cancer. As such, when entertainer Danny Thomas founded a children’s hospital, he named it after St. Jude. There are patron saints for just about everything imaginable under the sun. I do believe, however, that sick children have a very special place in the heart of Our Lord. Far from being the patron saint of scholars or accountants, St. Jude intercedes on behalf of sick children and their distressed parents. I imagine that intercessory oversight of that magnitude shows that St. Jude is truly quite honored in Heaven. The idea that Our Lord would entrust the prayers of and for sick children to the watchful eye of St. Jude means that he is perhaps the most highly honored apostle of them all. Saint Jude, Hope of the Hopeless, Pray for me.